January 11, 2015 - We've come back to the dog shows! After almost a year of absence from the show rings on Sunday we've come back to the dog expo with Dolce, our yeoungest female. As usual, when we wake up had a laziness attack and both me and Erica had tought: "why should we do it?". 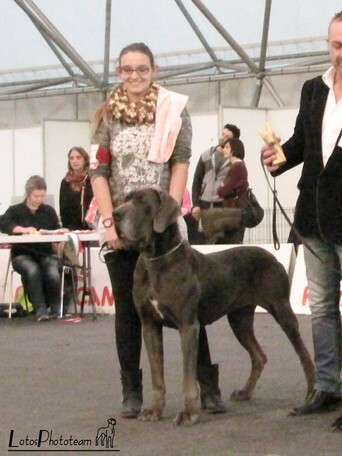 Then we woke up from the bed and we went to the dog show, close to Milan and very close to our home. This show was really important because it was a Special Breed dog show, one of those show you must win to gain the Italian Champion title ... and we did it! Our Dolce, regardless the long time of absence from the rings and the poor training, did very well and has won all she could: CAC, CACIB and BOB! We are really really happy! As usual Erica has been a perfect handler: good girl!